The extension to Mrs Thatcher's Right to Buy scheme - controversial at the time - promises to be one of the first big controversies of the new Conservative government. Up to now it was only council tenants who had the right to buy the homes they had previously rented. But when the Housing Bill becomes law - as outlined in the Queen's speech - housing association tenants will acquire that same right. As a scheme already rejected by the Scottish and Welsh governments, who wish to preserve publicly-owned housing stock, it is also emblematic of the different directions being taken by different parts of the United Kingdom. Potential buyers must have been tenants for at least three years, the same as with council tenants. 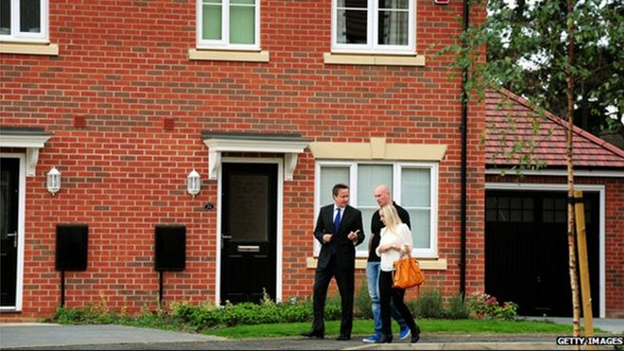 The government says that means up to 1.3m housing association tenants will be eligible in England. Around 500,000 housing association tenants are already eligible for some discounts. So the new scheme will extend rights to a further 800,000 tenants, and increase the discounts available. In Wales the government is planning to abolish Right to Buy entirely, and in Scotland it will be phased out by August 2016. A separate scheme exists in Northern Ireland. For those eligible, discounts start at 35% on a house and 50% on a flat. The maximum is 70%, but that is currently capped at £77,900 outside London, and £103,900 in the capital. For example, someone who has been a public sector tenant for ten years could buy a £100,000 flat for just £40,000 - using a 60% discount. Under the government's new Housing Bill, Local Authorities will be required to sell off their most valuable council houses, whenever they become vacant. The government estimates this would raise £4.5bn. The councils will then have to build replacement homes with the money raised, and the surplus will be used to fund Right to Buy. The government will make up any difference. The government hasn't yet said what this policy will cost the taxpayer, but it has promised to refund the discount to the housing association involved. The National Housing Federation (NHF) which represents all the UK's housing associations, has calculated that in total Right to Buy for housing association tenants might cost £11.2bn, if all those tenants who could afford to buy did so. The Institute for Fiscal Studies (IFS) has said it would potentially cost "billions of pounds" over the next parliament, and it "would worsen the UK's underlying public finance position". The IFS said it would also represent a "substantial giveaway" to housing association tenants. Will it mean fewer homes for social rents? The government argues that by selling off housing association homes, but by requiring a replacement to be built, the scheme will, in effect, double the number of homes available. It will also raise the proportion of home-owners in England, which has fallen over the last few years. But the NHF argues that since 2012, only 46% of homes sold off have been replaced by new ones, despite a requirement for local authorities to do so. One problem is that councils - particularly those in urban areas - cannot find enough land to build on. Around 2.5m council tenants across the UK have bought their homes since Right to Buy started under Mrs Thatcher's government in October 1980. 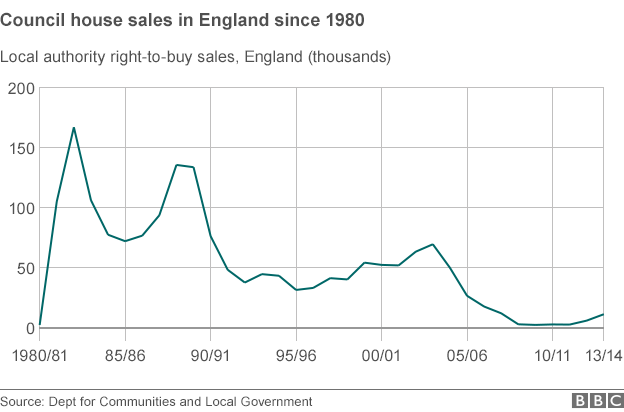 The numbers buying peaked at 167,000 in England in 1982/83, but fell to 3,179 in 2009/10. After the discounts were increased, sales went back up to more than 15,000 in 2013/14. The government hopes the number will now rise further. How many tenants will be able to afford to buy their homes? Around 15 to 35% of housing tenants eligible for the new scheme will be able to afford to pay a mortgage, according to the NHF.. That means around 221,000 households might be keen to take up the offer - but potentially fewer than that if mortgage rates begin to rise, as expected, over the next couple of years.